The belly chakra’s color is Yellow. This is the third chakra in our system. It lives fro just below your belly button to your sternum. The belly chakra is the home of your personal power. It’s the home of self-perception and self-understanding. It’s where you manage yourself. It’s also the place from where you interact with others. When you have a Yellow year, you are learning about your experience with power, your understanding of self, and your ability to interact effectively with other people. Six people chose a yellow color this year. Of those, only 3 colors were chosen. Star Dust, Sun Gold and Sunflower Yellow. Because the belly chakra is centrally located, and because it’s dealing with personal power and perception of self, we don’t tend to think of it as a divine chakra. And yet, divine energy works with every chakra. Star Dust and Sunflower Yellow are the two yellow colors that relate, specifically to divine energy. Star Dust is about connecting, powerfully, to divine energy, to the beginning, to the origin. 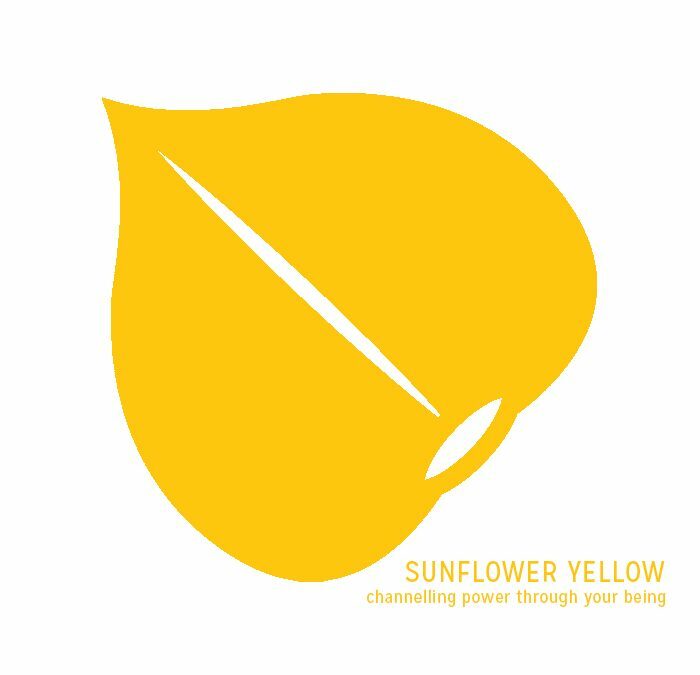 Sunflower Yellow is about allowing divine energy to work through you, powerfully. It’s the act of directing or channeling divine energy through you. And I love that someone chose Sun Gold- which is about being nimble and shining bright! If you chose a yellow, look in your email for a special sweet treat from me! Alana chose Star Dust, writing There was a color floating in front of my eyes the other night as I thought about my color of the year. When I looked at the swatches, Stardust was the closest. I’ve donated to NRDC. Thank you! Oh, I am thrilled that you chose this, Alana! You are the right person and this is the right time to connect to origin energy through your belly chakra! You are such a wonderful combination of wisdom and friendliness and kindness. I see this year being one where you connect and create a great foundation, which will drive your work and your personal life. This doesn’t mean you’re starting over. It means that you’re putting that origin understanding under what you’ve already created, to support you. 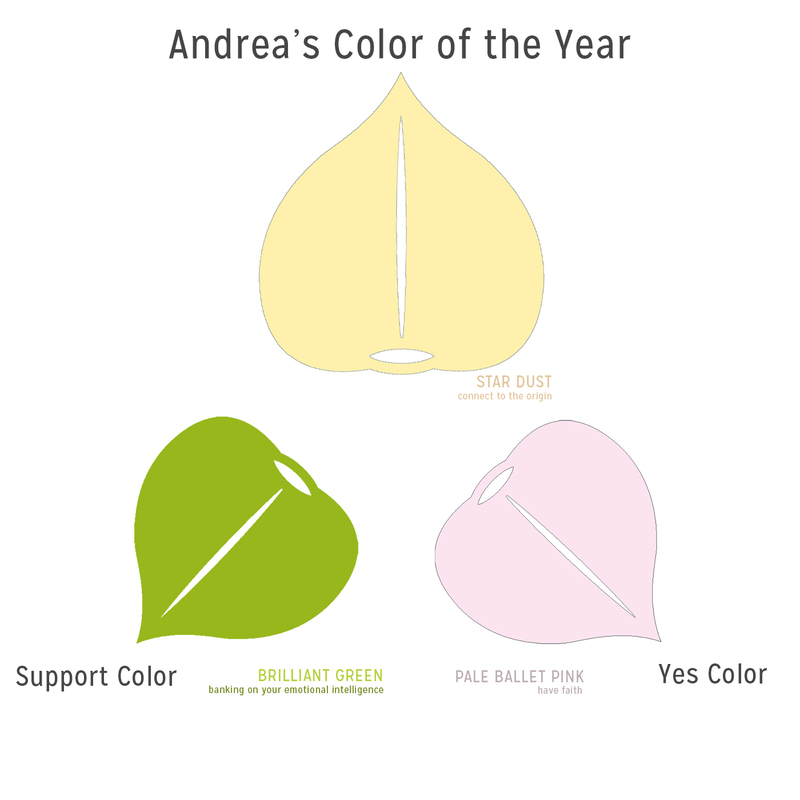 As a Support color- I want you to have Pale Apricot. You need intimate experiences that are fundamentally supportive, and wearing this color will help with that. And your Yes color- I’m giving you Petra Pink, which, when you’ll see it, will remind you to find the hidden the wonders. Andrea chose Star Dust, writing My color is Star Dust. I donated to Mary’s Place in Seattle. What a professionally challenging and vital year you have ahead of you! When we are called to make something big and amazing happen, we need to bring our full selves to it. And you have a unique opportunity to make this year a time of great creation and positive change. It’s not the only time you’ll ever have to do this, but it is a great time to fly! Connecting to the origin, – this act creates an engine of powerful understanding- which leads to powerful creation, which leads to great changes. Your Support Color- I’m giving you Brilliant Green. Wear it to remind yourself that you can bank on your emotional intelligence. This powerful part of you is a necessary skill for your work. Use it all the time! And your Yes Color- Pale Ballet Pink. Look for it as a reminder to have faith! Oh Crosby- Could you have picked a better color for your year? No, you could not! WOW! It’s a bright, powerful, amazing color of movement and joy! I just love that you chose it and I hope you wear it or have it in your office as an everyday reminder of how bright you shine and how nimble you can be. To balance that vibrancy, I’m giving you the Support Color of Sugar Maple- Sugar Maple is relishing the sweetness of the season. It’s the reaction to the action. This is such a sweet and wonderful time. And your YES color- the color to look for when you need it, is Blue Chalcedony. Blue Chalcedony is the color that calms and centers. May your year be lovely and balanced! Cynthia chose Star Dust, writing, Star Dust from your colors!! Dawn’s Home a safe place for those transitioning out of trafficking. Oh Cynthia! A good choice for you! Connecting to the origin, the divine beginning is such a supportive act for you, and vital as you move forward. It’s going to be heartening and provide you with a deep understanding and support for this year! To support you, I suggest you wear Peony (even just a little bit), to allow you to see your visible progress. You have a lot going on, and you are moving things forward! And your YES color- is Madrone- which means fertile ground . This color will pop up to remind you of the rich fertile groundedness that you have available to you. I can’t wait to see what you create this year. Maureen chose Sunflower Yellow, writing, Donation made to JB’s Soul Kitchen in my town. It was started and still run by Jon Bon Jovi, and it feeds everyone who shows up whether or not they can pay. My color is Sunflower Yellow. 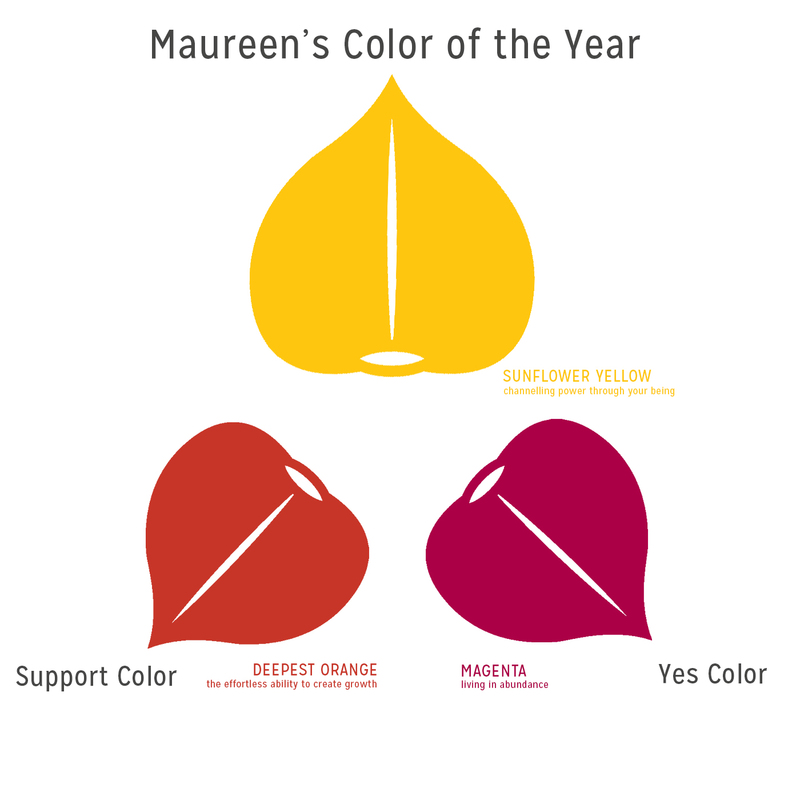 Maureen- a powerful choice, this Sunflower Yellow. As you help your clients and customers and friends and family, you’l be channeling more power through your being than ever before. Hey- this isn’t that far from your Kind Object this year, eh? To support you- I give you Deepest Orange- wear it when you want to tap into your effortless ability to create growth. And your YES color- it’s Magenta. It’ll pop up to remind you that you are living in abundance. I hope your year is amazing, Maureen! 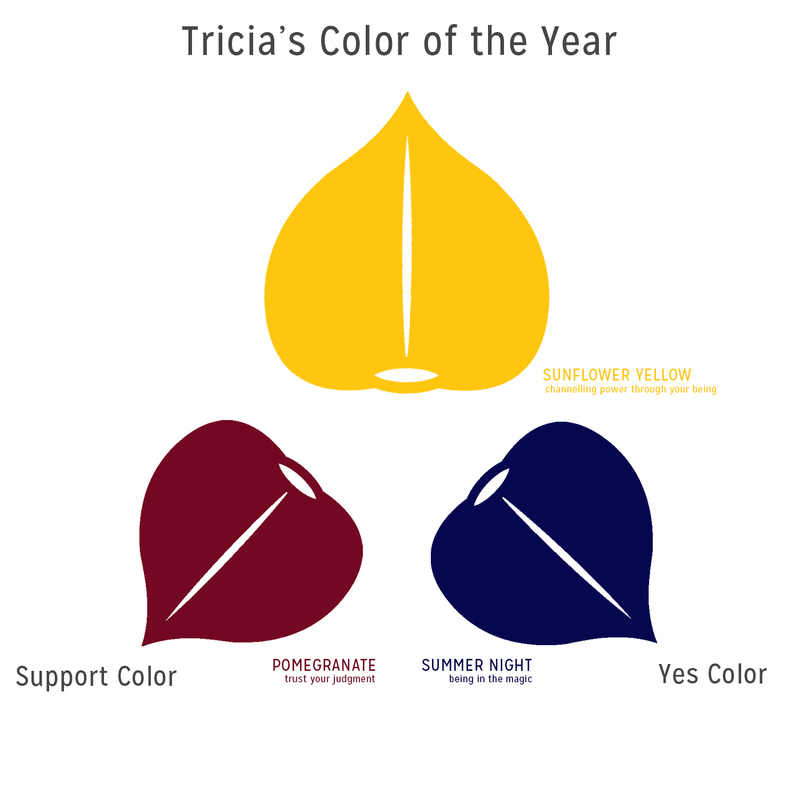 Tricia chose Sunflower Yellow, writing, I love this Bridget – thank you so much! I’ve donated to Kickstart for Kids. My colour is Sunflower Yellow. AH! wow. Tricia! I love that you are taking this color on, and I know you’ll have some amazing opportunities. The thing that I want you to remember- you can channel more when you are grounded. So make sure you’ve got that going on. 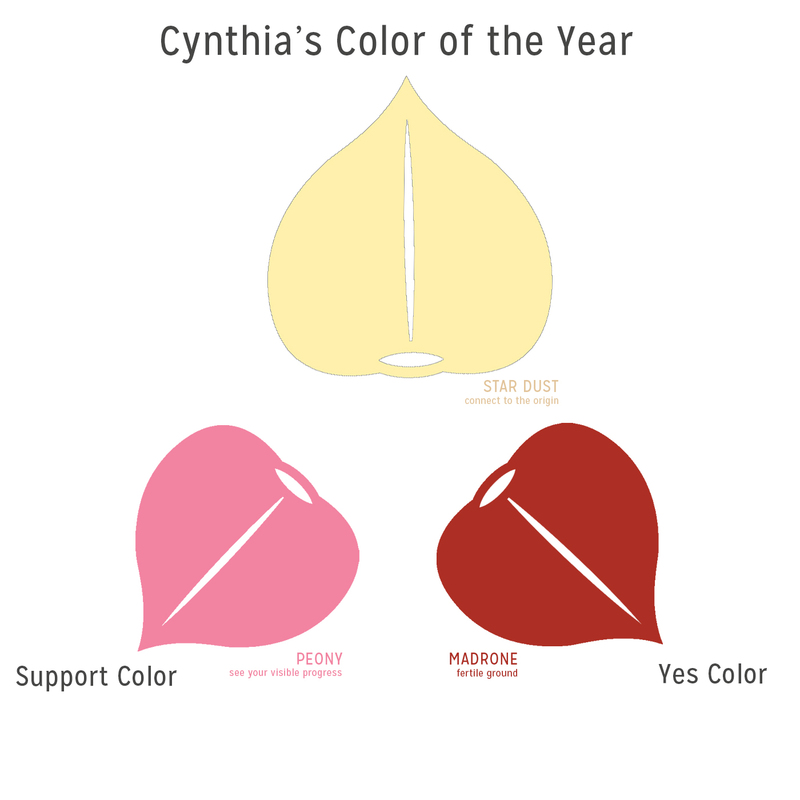 Your Support Color- I’m giving you Pomegranate! Wear this beautiful dark pinky-red when you want to remind yourself to trust your own judgment. You are a wise one, and I love it when you tap into that. And for your YES Color- Summer Night. When you see this saturated blue, remember that you are living in the magic every day! I am psyched to see how your year unfolds!